Delivra Corp (TSXV: DVA) is a largely unknown player in the cannabis sector. Although largely focused in the area of pharmaceuticals, it has quietly entered the area of cannabis based therapeutics. To enter the space, it partnered with, among others, Canopy Growth Corp (TSX: WEED) in an exclusive licensing agreement. Through this agreement and others, it intends to launch a number of cannabis therapeutics products within the next twelve months. In addition to this, it has experienced success in the natural medicine sector, hosting two No. 1 products amongst its portfolio. These products are currently available at numerous major retailers including Walmart, Shoppers Drug Mart, and Rexall. But who exactly is Delivra Corp, and why has seemingly no one heard of it before? UPDATE: The associated Q&A period with Delivra Corp’s investor relations team can be found here. Originally founded in 2007 by Dr. Joseph Gabriele, Delivra Inc is focused on the industry of pharmaceuticals. Its principle product lines focus on topical creams to specifically target pain points. These creams then deliver the medication through transdermal technology to the point of pain, rather than going through the body in the format of a pill. This enables the medication to be highly targeted, rather than it being dispersed through the gastrointestinal tract which has no targeting abilities. Delivra Corp became a publicly traded company through the amalgamation of Whiteknight Acquisitions III Inc, and Delivra Inc. At the time Whiteknight was a capital pool company in search of an aquisition to establish itself as an operating company. On August 31, 2015, the two companies entered in to a letter of intent for the proposed transaction. Under the terms of the proposed transaction, Whiteknight would change its name to that of Delivra Corp, with Delivra Inc operating as a wholly owned subsidiary. Current shares of the company would be consolidated on a 3.75:1 basis, with post consolidated shares being exchanged on a 1:1 basis with that of Delivra shares. Each share would be deemed to have value at a price of $0.75, with Delivra being acquired for a total price of $24,745,125. Further to these terms, all officers and directors of Whiteknight would resign from their current positions, with the exception of one Whiteknight director. The management team would then consist of current members of management from Delivra Inc. The deal was contingent on Delivra raising a minimum of $500,000 through a private placement. Delivra Corp’s share structure following the reverse takeover. The transaction was completed on December 21, 2015. After the close of the transaction, the company had a fully diluted share count of 46,350,899. At a price of $0.75 per share, this gave the company a fully diluted market cap of $34.7 million. A total of six over-the-counter products, including LivRelief Pain Relief Cream and LivRelief Nerve Pain Relief Cream. These products are sold in major retailers including Walmart and Rexall. The Delivra transdermal delivery platform, which it has made available for licensing to other pharmaceutical companies. This provides an alternative to oral medications. A total of 13 employees, six of whom are focused on LivCorp commercial activities, while seven are focused on research and development. 21 Natural Health Product registrations under Health Canada, and 11 under the National Drug Code with the FDA in the United States. Working capital of $2.3 million as of September 30, 2015. On June 2, 2016, Delivra signed its first licensing agreement for its transdermal delivery platform with Kalytera Therapeutics. Under the terms of the agreement, Kalytera has the exclusive rights to the use of the platform with synthetic cannabinoid compounds. This exclusive agreement is only valid for select ailments. With respect to payment, Kalytera is to pay for these exclusive rights through cash as well as common stock in the form of milestone payments. In addition to this, upon Kalytera receiving FDA approval, royalty fees will be applicable to any product sold that contains Delivra’s technology. Furthermore, other non-exclusive licensing is available for Kalytera related to cannabinoids. None of the licensing applies to the Canadian market. Specific financial details were not released. In September of 2016, Delivra entered into an agreement with Canopy Growth Corp. Within this agreement, Delivra is to supply Canopy with topical formulations for cannabinoid based creams. The formula provided would be exclusively distributed to the subsidiaries of Canopy Growth Corp. The reasoning behind the agreement is the fact that no comparable products were available in Canada at the time of signing. This in turn strengthens Canopy’s lead in the current market with respect to the different methods to intake cannabinoids. In addition to providing this formulation, the two companies would work together to further scientific evidence with respect to the application of cannabinoids through transdermal means. Financial details in relation to this agreement were not released. Furthering its licensing agreements, in March of 2017 Delivra signed a three way strategic partnership with Dosecann Inc and ARA-Avanti Rx Analytics Inc. 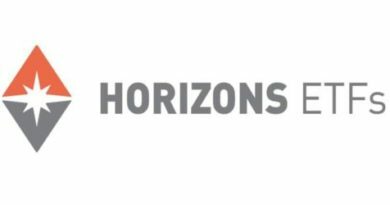 The focus of the partnership is to develop a suite of cannabis related products that further research, development, and the commercialization of medical cannabis. Under this licensing agreement, Delivra will develop a suite of cannabis related medications that tackle issues related to pain, sleep and anxiety. They will be presented in a topical format using Delivra’s current platform and then be put through preclinical and clinical trials. Dosecann will then market these products commercially. Avanti will then be responsible for the production and quality control of these products utilizing their GMP facility. Delivra will have costs associated with research and clinical trials paid for by Dosecann. Additionally, Delivra will have the intellectual property rights to the products, and will receive a royalty on products sold. Based on the investor presentation, it is estimated that this royalty percentage is a double digit figure. With strong similarities to the deal signed in March, Delivra entered a second agreement with that of ARA-Avanti Rx Analytics Inc in May 2017. This time, the focus is on that of hemp. Rather than use cannabis that contains THC, this product development is focused solely on that of CBD. This removes the psychoactive component that may be present in other cannabis related creams. Under this agreement, Delivra will again develop the product and formulations, as well as conduct any associated clinical studies. Again, they will not be responsible for the associated costs with this process. The intellectual property rights however will be shared between Delivra and Avanti. Avanti will then be responsible for quality control and production of their products, in Avanti’s GMP certified facility. Delivra will again receive royalties on any product sales that occur. This royalty fee was not disclosed publicly. As it currently stands, Delivra hosts a suite of products. These products are available under two lines: over-the-counter, and pharmaceuticals. These are summarized as follows. 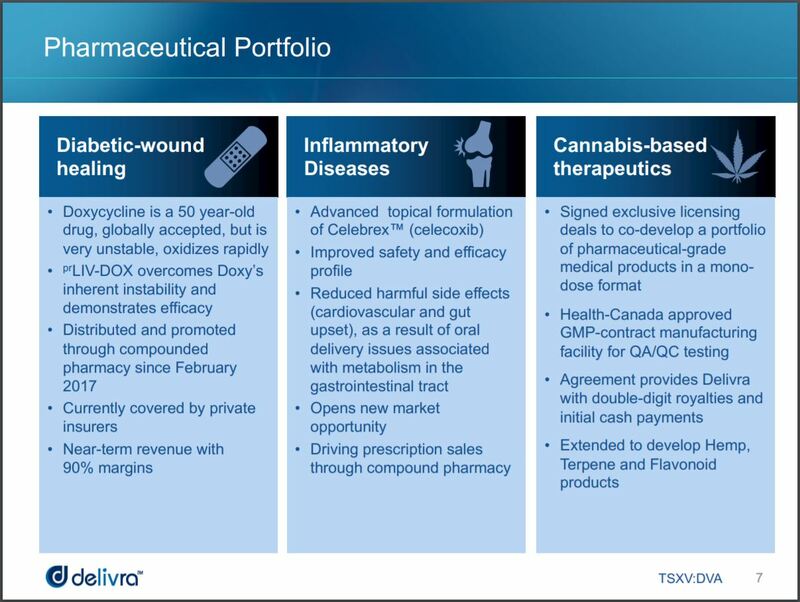 Delivra’s current pharmaceutical offerings as per page 7 of their investor slide deck. With respect to its current product offerings, Delivra has had success within its niche. Currently, it hosts two number one products for select ailments – LiveRelief Pain Relief Cream, as well as LivRelief Nerve Pain Relief Cream. It has maintained these positions within the marketplace for multiple years now, which shows the strength of the product in the sector. In addition to this, great potential lies within its pharmaceutical division. In each of the three categories Delivra has focused on, it has managed to improve current product offerings. For example, with respect to diabetic wound healing, it was able to take a gobally accepted product and improve upon its shortcomings. This in turn provides a better, more stable product to patients while maintaining a significant gross margin on the product. Furthermore, its studies related to cannabis could become a cash cow for Delivra Corp. With four licensing agreements related to cannabis and the related cannabinoids, it stands to become a major player within this industry. Specifically, the defined agreement with Canopy Growth Corp, the sector leader, provides a high degree of credibility to Delivra within the cannabis sector. Upon the further development of CBD markets, Delivra could easily become the market leader in the niche of topical creams for CBD products. The royalty payments alone stand to provide significant income to the organization. For each quarter of fiscal year 2017, Delivra has experienced higher revenues than that of the same quarter in the previous year. This points to significant growth being achieved by the company on an ongoing basis. However, it has been identified that sales are cyclical – the quarter ending September 30 typically has lower sales on average when compared to other quarters. Delivra Corp’s quarterly revenues over the last eleven periods. Evidence for this quarter typically being the low point of the fiscal year can be seen above. Although this recent quarter was weak relative to the second quarter, there was still a significant year over year improvement. Additionally, Delivra booked a higher gross margin than it did for the same quarter a year earlier, at 71% versus 65% last year and 63% the year prior. This is a strong indicator going forward for the company. 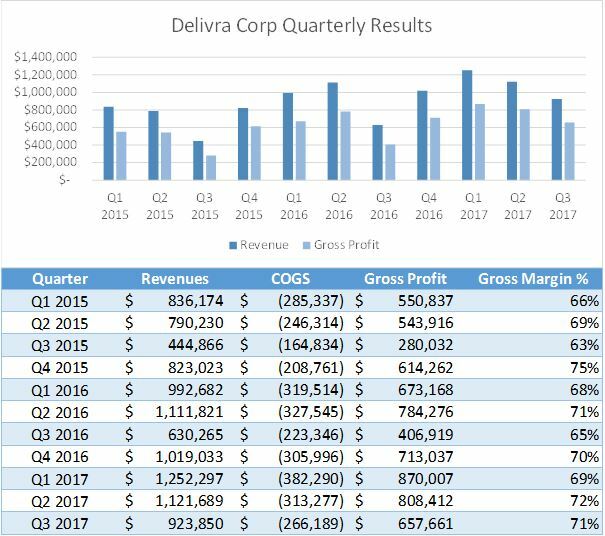 Delivra’s third quarter revenues for 2017. Overall, the company booked a total net loss of $419,193 for the quarter, or $0.01 per share. Comparatively, this is down significantly from third quarter 2016 when a loss of $2.2 million was booked,or $0.06 per share. However, also note that the share count increased by approximately 4.5 million over this time period which will slightly skew per share loss comparisons. With respect to the nine month period, the total loss through September 30, 2017 has amounted to $1,374,326 compared to $4,241,331 last year. This shows significant cost reduction measures have occurred throughout the current fiscal year. This equates to a loss of $0.03 per share versus $0.11. This appears to largely be attributed to reductions in marketing related expenses, which is notable due to the significant increase in revenues. The current share structure is unlike the majority of companies currently involved in the cannabis sector. 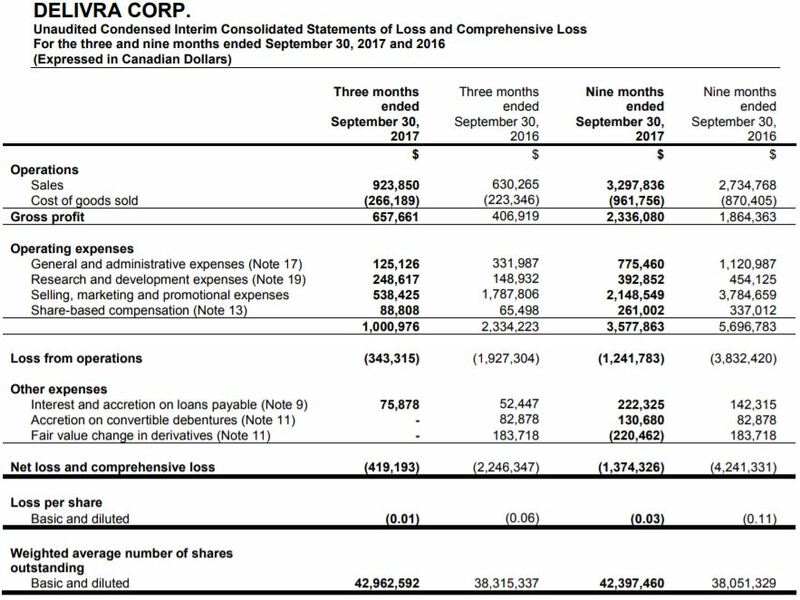 Rather than be diluted to the hundreds of millions of shares, Delivra Corp has chosen to stick with a tight outstanding share count. As of September 30, 2017, total outstanding shares came in at 42,973,027. As of the December 1, 2017 closing price of $0.40, this gives Delivra Corp a market cap of approximately $17 million. Delivra Corp’s share structure as of December 2, 2017. On a fully diluted basis, this figure is up slightly to 52,645,646. This figure is still considered small within the sector. As we have identified in other articles, there are countless companies in the sector with many multiples of this figure. Having such a small outstanding share count enables the company to increase its share price quickly as the value to investors rises. It is estimated that of the 42,973,027 outstanding shares, approximately 12,911,684 are in the hands of insiders. This equates to 30.04% of outstanding shares. Additionally, zero insiders have sold shares since the company was established as Delivra Corp on December 21, 2015. As a further benefit to shareholders, there is very little “cheap paper” that exists for the company. One common theme amongst countless organizations that have any level of involvement in the cannabis sector, is that there is cheap shares floating around. This typically is in the form of options or warrants. In turn, as the price rises, there is continuous selling pressure, as investors lock in gains of high multiples at a relatively low share price. Delivra Corp’s tight share structure largely prohibits this from occurring. However, there are a few options and warrants that are currently in the money for long term investors. Let’s take a peek. Delivra Corp’s current outstanding warrants, as of December 2, 2017. With respect to the current outstanding warrants, the cheapest are at a price of $0.25. However, these warrants at a total of 475,000 expire on January 30, 2018. As a result of them currently being in the money, expect them to likely be exercised shortly. Additionally, 1,175,000 warrants at $0.50 also expire on this date. If the share price continues its run that began on Friday, these just might be exercised. If the bullish momentum dies off, expect these to expire worthless. It is estimated that approximately 2,539,000 warrants belong to insiders out of the total 5,322,862 outstanding. This equates to 47.70% of current warrants outstanding. Delivra Corp’s current outstanding options, as of December 2, 2017. In addition to the warrants, there are a few sets of options that we need to be aware of. First, is 450,000 at a price of $0.30. These options, similar to some of our warrants, expire on January 30. The same conditions apply with respect to the probability of them being exercised. The next grouping to be aware of, is 1,690,000 options that can be exercised at half a dollar. Two thirds of these are valid for over three more years, so there is some doubt as to whether they will be exercised. These investors may be better off holding on to their cash until they are up significantly on these. However, 500,000 have a higher likelihood of being exercised in the near term if this bullish momentum carries on. Lastly, there are two things of note related to these options listed. First, of the total figure given at the bottom, 326,667 need to be deducted as a result of expiration. Second, is that the final line lists 137,500 options at a price of $0.46. These options were issued to the board, and can not be exercised as of yet. 50% will become available for exercise on June 20, 2018, and the remaining 50% will be available for exercise exactly one year later. Of these 4,349,757 options outstanding, it is estimated that 2,494,757 lay in the hands of directors or insiders. This equates to approximately 57.35%. The original founder of Delivra Inc back in 2007, Dr. Gabriele has seen the company through every stage of its growth. He has been resposible for the development of Delivra products as well as commercialization since he first formed the company. Currently serving as the CEO, he also advises the research that is conducted by the company. He has a multitude of related designations to his name, in addition to being a part of the faculty on a part time basis at McMaster University, as well as the University of Guelph. Currently, Dr. Gabrielle owns 6,242,234 shares, 2,539,000 warrants, and 920,000 options of Delivra Corp. The only other officer of Delivra, Mr. Pascal Attard came on board the company in June of 2015. He currently has his CPA and CA designation. He previously served as the controller for the company before being promoted to that of Vice President of Finance. Mr. Attard currently holds 21,500 shares of the company, in addition to 200,000 options. Serving as director since 2012, Mr. Fortino is currently an Executive VP of Metro Ontario, a large grocery and pharmaceutical retailer. He brings immense retail experience to the board, having experience working for companies such as GNC Holdings and Loblaws Companies. He also brings experience with regards to new product development. Mr. Fortino currently holds 1,000,000 shares in the company as well as 150,000 options. Mr. Hull currently serves as a senior financial advisor at Manulife Financial, a large financial conglomerate. He has experience in private investing in a number of sectors, including that of the medical sector. He currently has 1,066,700 shares and 150,000 options of Delivra Corp.
Nitin Kaushal came to the board of directors with a wealth of experience in the financial markets. He has direct experience in a number of related fields, including mergers and acquisitions, technology licensing, and investment banking. Brought on board in 2015, it is likely that he was related to Delivra going public, while now likely providing value through his experience in technology licensing. Mr. Kaushal currently has control of 250,000 options in the company. Mr. Smith also brings financial experience to the table. He has served in a number of officer roles, with the most recent being as the CEO of Frontline Broadband Inc. He has a wealth of experience with regards to financial markets, having co-founded Equity Financial Holdings. Mr. Smith also served as the Chair of the Via Rail board from 2010 to 2014. He currently holds 102,750 common shares as well as 250,000 options in the company. Experienced in the wellness sector as a financial executive, Mr. Thibodeau brings decades worth of experience to the board. Specifically, he worked at Canaccord Genuity, where he focused on mergers and acquisitions in their Health & Wellness division. He currently serves as the Managing Director of Wellvest Capital. Presently, Mr. Thibodeau holds 231,250 options in Delivra. The most recent director to join the team, Mrs. Greco joined the board in June 2017. She brings a wealth of knowledge to Delivra Corp, in both pharmaceuticals as well as her experience in senior roles. Most recently she served as the President and Managing Director at Johnson & Johnson Group of Companies within Canada, which is a notable achievement. In addition to this, she has her MBA, as well as a Bachelor of Science in Pharmacy. Currently, Mrs. Greco holds 137,500 options of the company. To say the least, we view Delivra Corp as currently being undervalued relative to that of its peers. 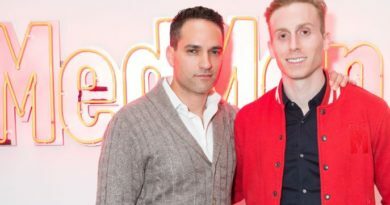 In the first three quarters alone, it had sales of $3.2 million, while last fiscal year it recorded $3.7 million in revenues. The growth of the company is evident. With the final quarter yet to close, a fair estimate for the yearly revenue would be approximately $4.3 million. Let’s not forget that its margins have also been continuously increasing on a year over year basis as well, while operational costs have declined significantly. Nor can we forget that a significant portion of the company is held by insiders, who have yet to sell a single share in the company. Currently sitting with an approximate $17 million market cap, its easy to see why this is: no one knows about the company. It may have two number one selling brands, a wealth of experience on its Board of Directors, and four cannabis related licensing agreements, but that doesn’t mean that their name is out there. A little brand awareness, mixed with its very tight share structure, could send this undervalued company soaring. Speaking of its cannabis licensing deals, we’re currently waiting on a response from the investor relations team. We’re in search of an update for this side of the business, including when they expect royalty fees to start rolling in. 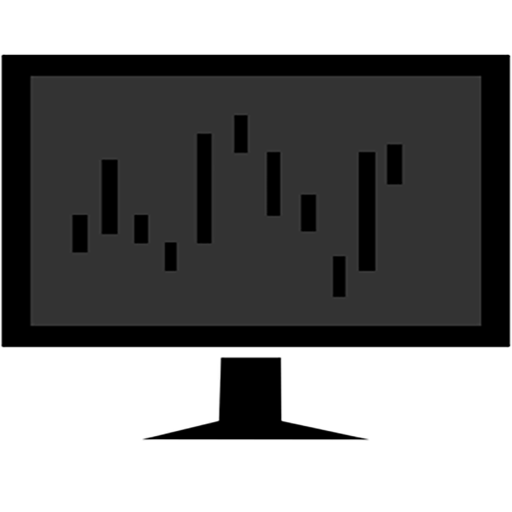 Once that occurs, we have a feeling investors will be rewarded greatly. We’ll be sure to provide a briefing based on the response we get from their team. Find the undervalued darlings. Verify your findings. Dive Deep. Information for this analysis was found via Sedar, Sedi, LinkedIn, Bloomberg, Shortdata.ca, LivRelief, and Delivra Corp. The author has no securities or affiliations related to this organization. Not a recommendation to buy or sell. Always do additional research and consult a professional before purchasing a security.